It has been one busy week. Thursday, I was with the McComb Public Library. And in a schedule arranged by them, I presented to a middle school there in town, a luncheon for a group of readers who meet in the library, a short presentation to a day-care center, and another middle school in Pike County. It was a wonderful day. 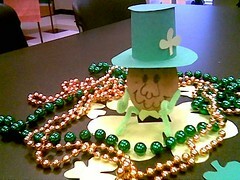 In honor of St. Patrick’s Day, each table at the luncheon had an Irish potato center-piece. Here is a photo of one of them. 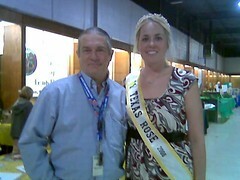 Last Friday, I taught my classes at Delta Community College, and then hit the road for the North Texas Irish Festival. Riding with me were my friends from the Celtic Society, Tom and Michael. We headed out to a pub I’d never been to–Tipperary Inn and had a grand time. I’ll probably have more posts about the NTIF festival as emails and photos filter in. I signed books at the NELA Celtic Society’s booth the whole weekend. I performed three times and my work seemed well received. Our booth was next to an organization devoted to saving Irish Wolf Hounds, the biggest dogs in the world! You should do a study on these beautiful, gentle with people dogs. Absolutely fascinating. 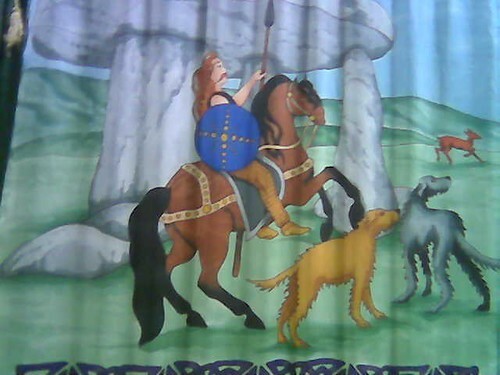 Here is a photo of a tapestry they had of Finn McCool (legendary Irish hero) and his two hounds, Bran and Sgeolan. 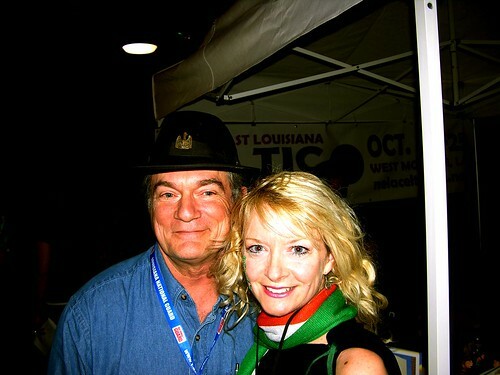 In my Irish set, I perform the song, “Rose of Tralee.” I was delighted and honored to meet Roisin Mulligan who was the 2008 Texas Rose of Tralee. She was born in Dublin Ireland and moved to texas at the age of five. She teaches kindergarden in Burleson, Texas. A beautiful, wonderful lady. 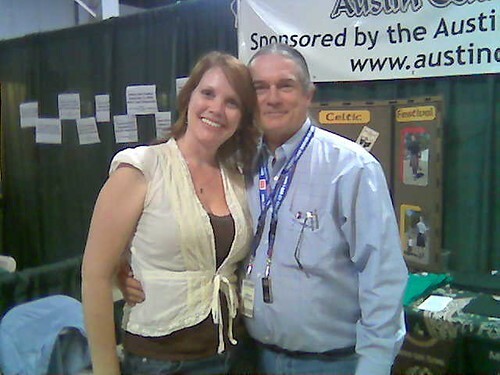 Here is a photo of Rhonda Loeliger, one of the key people for the Austin Celtic Festival which will be held Nov. 7-8 2009. This beautiful and sharp lady works for the largest Celtic gathering in Central Texas. They consistently have some of the best of internationally known Celtic performers on their program. You can find their website here: www. AustinCelticFestival.com. Here are photos of Shelia Hoh, who is with the Scottish Society in Minden, Louisiana. With folks like this beautiful and talented woman working for and leading them, I predict great success for their society. Tomorrow, I’m at the Vernon Parish Library. I also have a radio interview to do around noon. Next post will likely be Tuesday night. I attended both the Austin Festival and the Salado Festival. Reasonably sure Salado is still larger. Largest Scottish event in Texas is the Texas Scottish Festival. NTIF was fantastic this year. Lot’s of great groups. My favorite was The Barra McNeills.